P3P coaches are role models and mentors for young people, as well as leaders in their community. As a P3P coach, you will be provided with the tools and assistance needed to allow you to guide sports driven youth on the road to personal and academic success. 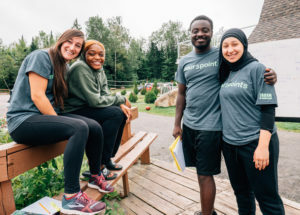 You will be part of a group of coaches carefully selected for their leadership and their will to make a long-term impact on the lives of dozens of young people. Join the next cohort of coaches-in-training! Submit your application before 11:59 p.m. on April 28, 2019. Please note that the application selection process will begin on May 1st and that no follow-up action will be taken before the submission deadline. Why take part in the training? The Pour 3 Points Coaching Certification Program is the only program in the world for those who coach extracurricular sports in schools. 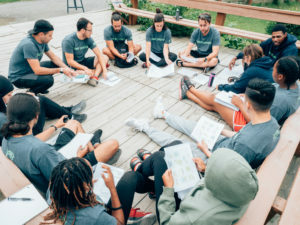 The program aims to develop the skills that help coaches intervene with young people, particularly those who are at risk of dropping out of school, with the goal of educational and social development. At the end of the training program, coaches are better equipped to accompany young people as they develop the skills required to succeed at school and in life. The opportunity to progress within a Montreal-based team of coaches willing to help young people achieve success in school and in life. Full-time students are eligible for a scholarship of up to $4,000. Coaches who are studying to become teachers are given priority on substitute teacher lists at schools. Coaches in training commit to actively participate in all training activities during the year, including coaching a sports team, training days, individual and group meetings as well as all preparatory work, reflection and evaluation. This represents on average 10 hours of involvement per week. Coach a sports team at 2 practices per week. 10 hours of support from our development advisers. 6 three-hour meetings with other coaches-in-training (co-development). Work related to training activities (preparation, planning, reflection exercises, reports, etc.). Participation in the program evaluation carried out by McGill University and UQAM. Participation in fundraising events and promotional activities for the organization (based on availability). Note: Coaches selected for the Pour 3 Points Certification Program do not have to pay any training fees. “As an athlete, I learned to seize every opportunity to improve. P3P training was a chance for me to become a better coach. The variety, but especially the quality of the training impressed me. Pour 3 Points taught me to focus on myself and on youth empowerment. I benefited a lot as a basketball coach, but also on a professional and personal level. Program participants like facing challenges and getting out of their comfort zones by trying new strategies, surpassing themselves, and questioning their intervention habits. They are responsible for their own learning and actively participate in all of the training activities offered. They are curious and capable of introspection, and contribute to the learning of other coaches. All year long, they set aside time for learning, so as to take full advantage of the pedagogical strategies offered in the program. Finally, they prioritize their learning and equip themselves with the means to bring their coaching to the next level. Be willing to coach in one of the Pour 3 Points partner schools for the 2019-2020 academic year. Otherwise, you may suggest a new school! Check here to see if your school meets the P3P Program requirements. Be a “novice coach”: a “novice coach” has little or no coaching experience. In general, someone who has been coaching for less than 4 years is considered a “novice coach”. However, a more experienced coach may qualify in certain circumstances. Commit to participating actively in the program assessment conducted by McGill University. What is the process of a coach in training? Submit your application before 11:59 p.m. on April 28, 2019. In addition to answering the questionnaire, you need to attach a curriculum vitae that includes your experience as an athlete and a coach, your education, your professional experience, and your volunteer experience. If your application is selected, we will contact you to schedule a selection interview in May. The interview will allow you to elaborate on the questions you answered on the recruitment form. If you are selected for the program, you will be notified at the end of May. A preliminary meeting with all selected coaches will take place in early June. The goal of this meeting is to provide you with more information and the commitments related to the training program. A contract will be given to you during this session, and you will have one week to sign it. If you were referred by one of our partner schools, you can continue to coach there. If you coach in another school, we will contact the school to see if a partnership is possible. If it is not possible, you must coach at one of our partner schools for the purposes of the program. If you do not currently coach at a school, we will suggest one of our partner schools. 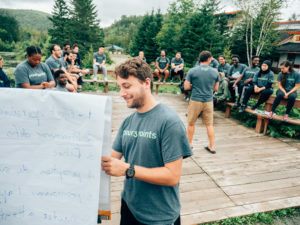 The Pour 3 Points Coaching Certification Program begins with a 4-day retreat in August (before CEGEPs begin their fall semester). You will get to know the other coaches, and your learning will begin. Starting in September, you will also begin coaching a team at your school. Throughout the year, there will be 4 other training days, 6 three-hour meetings in small groups (co-development), and 10 hours of support from our development advisers. At various times in the year, you will also be asked to participate, based on your availability, in fundraising or media events as a representative of the organization. You may also be asked to help create promotional or pedagogical tools. If you successfully complete the training program, you will receive your P3P coaching certification in June. All P3P certified coaches continue to be part of the P3P community. You will be invited to take part in various activities throughout the year and can collaborate with new coaches-in-training.